FOREVER ERRONEOUSLY referred to with a superfluous “S” at the end of the programme’s title, SPITTING IMAGE offered up detailed three-dimensional “latex lampoonery” of the most well known figures of the day, while less well-known figures were portrayed by either that puppet that looked like JIMMY TARBUCK, or the one that was a dead ringer for FREDDIE MERCURY (this one also doubled for all waiters shown on the programme). Broadcast in the one outpost of the ITV schedule that for a time provided a home for vaguely anarchic comedy material, SPITTING IMAGE was a mainstay of the Sunday evening at 10 slot that had previously been occupied by the likes of WOOD AND WALTERS and CLIVE JAMES ON TELEVISION. 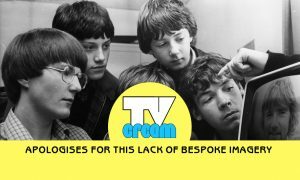 Yet given the former series’ obsession with making observations about dinner ladies who scratch their armpit with a spatula, and the latter’s focus on being “irreverent” but in a very middle class way, those Spitting Images offered up something that for its time seemed genuinely shocking. 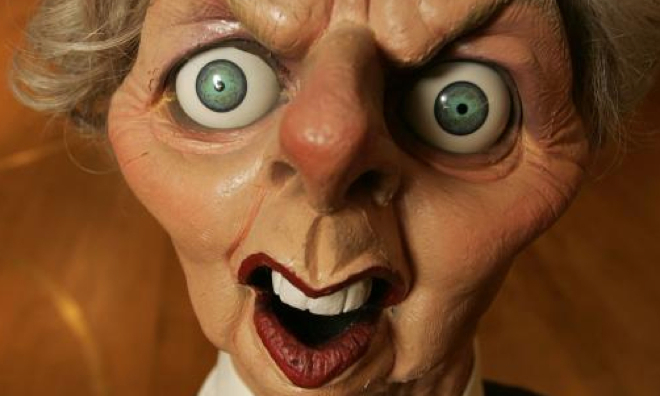 The show was cited as being culpable in the political destruction of DAVIDs STEEL and OWEN, while the fact that the average man in the street was able to name more than one member of Thatcher’s mid-Eighties cabinet is supposedly thanks to their memorable puppetry portrayal. Perhaps the series’s most heinous crime, though, was to provide early television exposure for the likes of ALISTAIR MCGOWAN and JON “CREEPY HAIR” CULSHAW. There is perennial talk of bringing it back, but working out how it couldn’t be rubbish now remains a persistent roadblock. Related Items:Latex lampoonery, Oh no - satire!, Who is this walking down the street? Didn’t ITV try to do an updated version of SI using computer animation not that long ago? I don’t think it lasted very long, though. That would be Headcases. Wasn’t that bad actually – but didn’t have the topicality of SI. When they got it right they got it blindingly right, but they got bogged down in gratuitous Donald Sinden-baiting and easy targets a bit too often. I’ll still love them forever, though, for ‘Santa Claus Is On the Dole’, ‘Essex Is Crap’ and the wonderful ‘Every Silver Lining Has A Cloud’. It’s a shame it ended – Sunday evenings on ITV have never been the same since..
Wasn’t the Freddie Mercury-alike puppet supposed to be Lord Lucan? I only started watching it in the 1990s (too young before then) so most memories were of a grey John Major, doing something daft, his Mastermind specialist subject was Passing The Buck with every answer Norman Lamont. My brother might still have some on tape from that era.